Dinosaurs Alive! 3D is another interesting and entertaining 3D IMAX documentary that brings dinosaurs to life and also challenges some of the existing theories on these ancient creatures thanks to careful re-enactments and cleverly crafted interviews. Narrated by Michael Douglas, Dinosaurs Alive! 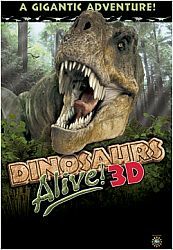 3D follows a group of dedicated palaeontologists from the American Museum of Natural History as they traverse the globe while discovering new dinosaur fossils and information relating to their evolution. Best of all, the content is quite relatable and ensures that the everyman will easily understand the theories and dialog. Using state of the art CGI (computer generated images), the movie helps draw the viewer to a primordial era as dinosaurs roamed the planet as the palaeontologist uncover fossils and discuss how these creatures may have lived. From the dunes of Mongolia’s Gobi Desert that boast almost perfect fossilised bones to the sandstone mountains of New Mexico which shed a new light on how these creatures lived, fought and died, it is a very gripping journey, especially on the IMAX screen. We also learn that the descendants of the dinosaurs are still with us, not the crocodiles but rather, the birds. Although the documentary is well paced and some of the CGI is truly awe-inspiring, at times the documentary presses on a few different points, however it lacks some detail or follow-up which is a shame. At 45 minutes which is the length of the documentary, just when things get interesting, the viewer is unfortunately whisked away to another scene or theory which may leave you scratching your head a little. Nonetheless, it's a spectacular documentary that will stimulate debate but specifically, help people understand these giant creatures a little better and what better format than IMAX?